Because I’m a visual learner, reading examples of query letters that actually nabbed assignments in magazines and newspapers is always of great interest to me. So for today's post, I dug through my old files and found a query that landed me my first assignment with The Writer back in 2009. Enjoy! 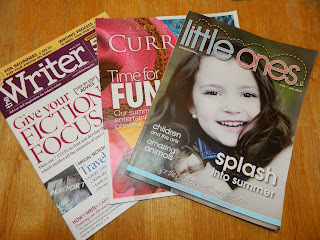 As a freelance writer, I do not hide the fact that I am a magazine junkie, and I particularly enjoy reading magazines like The Writer that offer helpful, informative tips for my career in a straightforward format. In recent issues, I enjoyed Julia Tagliere's article on how to write about friends and families without alienating them in the process (October), as well as Debbie Geiger's advice on how to use social-networking sites more efficiently in freelance writing (August). After I had my first child six years ago, I began reading every book I could get my hands on about freelance writing so I could learn how to develop a career that would allow me to set my own hours. Like many aspiring parent writers, I sent off a few article ideas via snail mail to the big parenting publications like Babytalk, Parents and Parenting. For the most part, I never got any responses back, except for one horribly photocopied stock rejection letter that almost crushed my dreams of writing about parenting forever. However, I took some of those same queries and sent them out to a few local regional parenting publications, and within a few months, had made several sales. For the next few years, I wrote locally and even got a job as a stringer for the daily newspaper. Eventually, I took a job as an associate editor at the regional parenting publication that had given me my first break, where I made a startling discovery -- there was a lot more opportunity for publication in regional parenting publications than I had originally thought. I always take a special interest in the "Market Focus" of your publication, and I've noticed there is one market in particular that hasn't been profiled in the past two years -- regional parenting magazines. Like me, many writers think if they don't live in a city like Atlanta, they really don't have any business writing for Atlanta Parent. Not so, I realized. Regional parenting publications may have a much lower pay scale than the nationals, but most writers have a better shot of getting published in these magazines, and if they market themselves properly, they can generate a steady reprint income. I'd like to propose a 1,200-word article titled "Writing for the Other Parenting Magazines" for your "Market Focus" section. In the article, I will discuss the types of articles and essays regional parenting publications seek, the importance of checking editorial calendars, lead times, reprint possibilities and evergreen topics many of these publications seek each month. "Writing for the Other Parenting Magazines" will also include a sidebar titled "Five Ways to Sell a Parenting Article in a Regional Publication." I am a freelance writer whose work has appeared in numerous regional parenting publications. I am a former associate editor of Charlotte Parent and also a contributing writer at www.iParenting.com. My article, "Alternative Treatments for Autism," recently took first place honors in the magazine feature article category of the 2009 Writer's Digest Annual Writing Competition. I am including the clip in the body of this e-mail. I look forward to hearing from you regarding this article idea. I'd love to hear your query success stories! Renee Roberson is an award-winning freelance writer and editor who blogs at Renee's Pages. I don't really write query letters, so I don't know much about them, but what I do know is that yours seems to go against all the so-called 'rules' for the format. AND IT WORKED, so great job, you! I'm actually interested in the mention of autism, too -- I have twins with autism and like to hear about other people who have some experience with it. I'm going to go check out your other blog. I have written many query letters with varying success. I am published in regional and national magazines, so have done something right, and I've also had my sting of rejections. I think what you did was really sell your article-- you showed belief and conviction and experience for your topic. The formats have a lot more room for variation than is touted in all the "how-tos". The important thing is to convince the editor why your story is a perfect fit for their magazine. Awesome idea to post your query success here. THANKS! I would love to read that article, too, actually. :) I had a similar idea with pet stories--I had a boxer who had separation anxiety and I tried to sell to Dog Fancy, where the topic has been overdone. But I sold "an essay" about it to Grit and then an article about traveling with an anxiety ridden pet for a travel newsletter for dog owners. So, sometimes you just have to think outside of the box! Great post, Renee! It's generous of you to share your secrets. :) Seeing an example will be helpful to a lot of people. Briane -- Thanks for stopping by! I was actually kind of surprised when I read back over this query because I felt like the tone was almost TOO conversational! Something must have worked though because the editor really liked it. I have a nephew with autism and has thrived under different biomedical treatments, which was the inspiration for that particular article. Julie -- A lot of successful queries also hinge on the perfect timing. In this case, they already has an article about writing for parenting magazines in the can, but the editor liked my angle and offered me a sidebar that they added into their article. I had no complaints about that! Margo -- Good for you for persisting with your topic and making multiple sales off of it! So many times I give up on an idea after one magazine never responds:( I'll see if I can find the article online and send you a link. Marcia -- I hesitated on sharing this because I didn't know if it would be interesting enough to our readers. But I know seeing examples of queries works so much better than reading what the "formula" is so I gave it a shot!